'Tales of Suspense: Hawkeye & The Winter Soldier' review: Kevin Feige, read this book! – AiPT! 'Tales of Suspense: Hawkeye & The Winter Soldier' review: Kevin Feige, read this book! ‘Tales of Suspense: Hawkeye & The Winter Soldier’ review: Kevin Feige, read this book! Matthew Rosenberg and Travel Foreman bring us the buddy book we never knew we needed. These are just two of the questions fans of the Marvel Cinematic Universe often find themselves asking. To these individuals I say read Tales of Suspense: Hawkeye & The Winter Soldier by writer Matthew Rosenberg, artist Travel Foreman and color artist Rachelle Rosenberg. Not only are the five issues (Tales of Suspense #100-104) contained in this trade paperback brilliantly executed, but this entertaining spy story could easily serve as the blueprint for an excellent Black Widow and Hawkeye film. Honestly, this story shouldn’t work as well as it does. While Hawkeye’s Matt Fraction-David Aja-helmed solo series was critically acclaimed, he kind of lost his way in recent years (murdering a beloved character like the Hulk will do that to you). The same could be said of the Winter Soldier, who was so hot he became a movie star and then ended up in a short-lived and nostalgiatastic Thunderbolts reboot. Then, you’ve got a plot spinning out of Secret Empire which, while a strong concept itself, became so mired in online controversy even its supporters just wanted to move past it all. Oh yeah, and Tales of Suspense hasn’t been on the stands since the late ’60s. But despite all these factors, this trade paperback is downright awesome thanks to Rosenberg and Foreman’s talents. I’m not even a fan of spy stories and I couldn’t help but tear through these pages with joy. This is due in large part to the hilarious dynamic Rosenberg establishes between Clint Barton and Bucky Barnes. The story begins with Hawkeye seemingly bumbling through a private funeral where members of Hydra are present, and eventually knocking over the casket and burning down the funeral home (hey, we all make mistakes). But Clint was there decked out in his nicest purple shirt because he has a hunch the Black Widow, who was killed by Hydra Captain America during Secret Empire, is still alive and picking off Hydra agents. 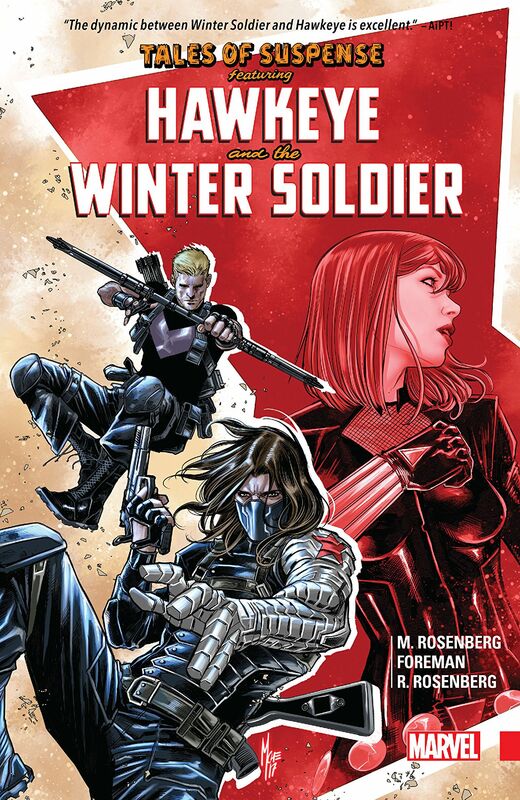 It’s not long before Hawkeye’s quest for answers brings him into direct confrontation with the deadly Winter Soldier. While Bucky doesn’t believe Natasha has returned from the dead, he thinks someone wants the world to reach that conclusion. The two men agree to put aside their many differences (really, their dislike for one another boils down to the fact that they both dated the Black Widow) and find out just what exactly is going on in the shadowy corners of the Marvel Universe. There’s even a run in with the mutant Boom-Boom–er, I mean Skids, because it’s a Rosenberg comic and the man loves him some New Mutants! By now, it’s a pretty well-known fact that the Black Widow does indeed return to the land of the living by the end of this story (she has her own Infinity Countdown comic out this month), but if you haven’t read Tales of Suspense, I won’t reveal how exactly she’s brought back. Spoiler alert: It has nothing to do with the Phoenix, but does lead to some amazing interactions with a talking bear. After Aja reinvented how we visualize Hawkeye, Marvel knew they had to toss any Barton-related assignments to artists with stylish pencils. Cue Foreman, whose slick art is the perfect complement to Rosenberg’s action-packed story. Our heroes are pretty big jerks, but through Foreman’s expressive line work, we can’t help but root for them… and kinda want to hang out with them. Rachelle Rosenberg’s vibrant colors only enhance Foreman’s artwork. Also, I love Hawkeye’s mask-inspired skullcap. If Marvel hasn’t made one for fans to buy and wear–get on that, apparel division. By the end of this book, some will surely find themselves on either Team Clint or Team Bucky (though all readers will likely feel for Hawkeye a bit). Or, they’ll hope Natasha ditches these buffoons once and for all. Ultimately, no matter which of Natasha’s exes you prefer, all readers finish this collection a winner. I’m not sure what the future holds for these three, but if Marvel was smart, it’d keep them together under the guidance of this stellar creative team. And keep that title! Several decades after Tales of Suspense introduced the world to Iron Man, the title reminds readers it can still take their imaginations for a wild ride in the mighty Marvel manner. If Kevin Feige was smart, he'd use this action-packed spy thriller as the template for an amazing Black Widow-Hawkeye movie. Matthew Rosenberg does it again with this addictively fun tale. Every character acts exactly as they should with Hawkeye being the hilarious standout. Together, Travel Foreman and Rachelle Rosenberg deliver visuals both striking and cinematic.